COME & SEE this really cute Ranch w/curb appeal! CHARMING w/3bdrm, 2full bath, w/1car garage & spacious deck overlooking this wonderful backyard--one of only a few lots that back to subdivision common ground/trees! 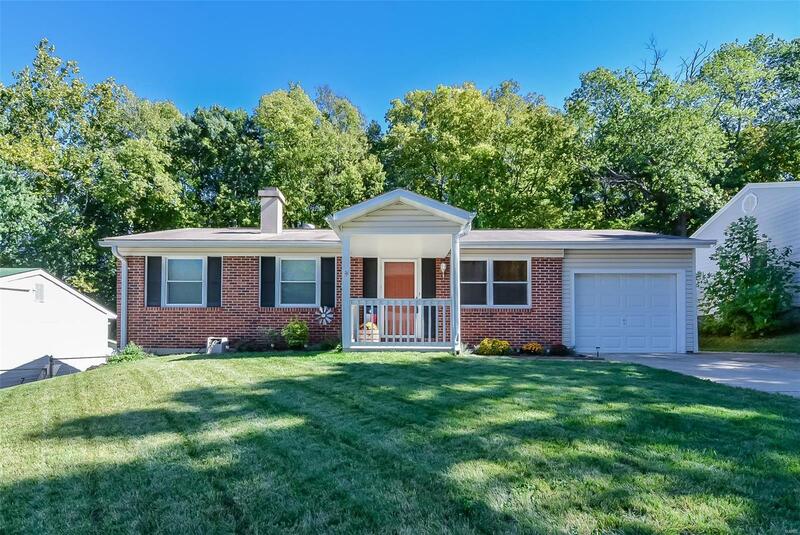 All this under $165k in St Charles Co. near Monroe Elemen & West High! This Ranch is nearly 1300sf livable space & has original hardwood floors in main areas, newer can lighting, thermal windows, ceiling fans, OPEN living/kitchen area for entertaining, cute painted cabinets w/accent brick look wall, fridge,ceramic tile floor,gas stove; 3 bedrooms, (although one is a closet & it is used as a dressing room but can easily be a nursery or bedroom as before) & there's a full bath on main level w/granite top & updated light; The lower level has a very cool woman/man cave w/bar(bar TV stays), another full bath, then a 24x10 studio or office/music room/ flex space.. see the stained concrete floor & gas fireplace, can lighting? THIS LL waits for your COZY Super Bowl party!